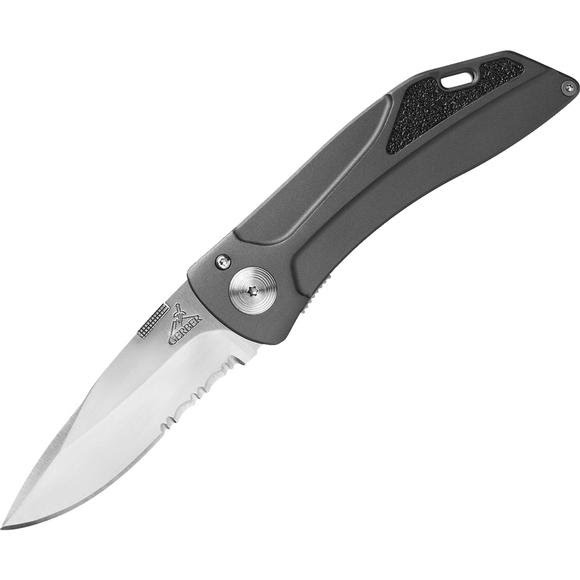 Equip yourself with this Gerber clip knife with serrated edge. It is ideal for hunting, fishing, camping or everyday use. The Impression serrated folding knife features a corrosion-resistant blade that is constructed from surgical steel and measures a total of 3 inches long. It has dual thumb studs that allow for easy opening and a lightweight aluminum handle that is contoured for comfort. Equip yourself with this Gerber clip knife with serrated edge. It is ideal for hunting, fishing, camping or everyday use. The Impression serrated folding knife features a corrosion-resistant blade that is constructed from surgical steel and measures a total of 3 inches long. It has dual thumb studs that allow for easy opening and a lightweight aluminum handle that is contoured for comfort. This Gerber folding knife is equipped with a low rise pocket clip on the side and measures a total of 7.1 inches long when fully extended.